The Kingwood Public Library is located on Main Street in Kingwood, Preston County, WV. It is a fairly modern and low-key building built around 1966, not unlike many other public libraries built around that time. However, it has something that sets it apart from most other libraries...a ghost! According to data provided by Assistant Librarian Debra Titchenell to the WVGhosts website, staff has witnessed a wide array of paranormal activity. Strange noises are heard, including footsteps walking up and down the concrete stairs to the basement. Objects move around on their own accord, and doors open and close without any living hands assisting. Most interesting are the stories of books actually jumping off the library shelves! Objects moving by themselves, especially books that seem to fly off shelves, is often indicative of what we'd call poltergeist activity, which loosely translates to "noisy ghost." And while many believe that a poltergeist is actually a spirit, others give it the explanation of recurrent spontaneous psychokinesis (RSPK), which is short means that the activity is actually telekinesis caused by a living "agent," generally a pubescent female, but can include anyone going through high energy changes, hormonal fluctuations, etc. Since libraries often are filled with children and young adults, it might seem like this is a plausible explanation. However, Titchenell proposes an even better explanation, involving the history of the building itself. 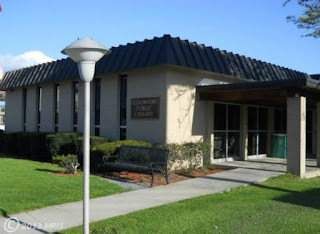 Although the library was built in the mid 1960s for use AS a library and has not housed anything else, the land it sits on has a long history with the town of Kingwood. In April of 1871, the site on which the library now stands, saw the construction of a new jail. This new jail, which replaced two previous ones located adjacent to the courthouse, was built by McAfferty and Menear, using locally produced bricks. It served the needs of Kingwood and Preston County until ground was broken on a new jail located nearby in 1924. The new jail was completed and opened to inmates by 1925, leaving the previous jail empty. That year, however, the property was bought by the American Legion, and the building used as their meeting space. It remained in possession of the American Legion until 1966 when the Kingwood Volunteer Fire Department purchased it, and had the building torn down to make room for the new library. So although the building is gone, the land is the same...and as many researchers will attest, the land itself can be just as haunted as any buildings. In this case, it is believed that the land, and thus, the new building atop it, are haunted by the spirit of a former inmate who hanged himself. The type of activity experienced does seem to fit well with the type of behavior one would expect from someone who died violently at their own hands while sitting in captivity. Is he trying to make his presence known, or is he simply letting off a little raging steam? Also, who is this gentleman? I've done some preliminary research into trying to track down any suicides that occurred during the period between 1871 and 1925, but there isn't a lot of information available online. Compounding the confusion is another eerie fact. In 2005, the jail that replaced the one located on this site, was slated to close as WV was transferring into a regional jail system. However, during the last days of the jail, in late July into early August, THREE separate inmates killed themselves by hanging within a span of 2.5 weeks. In fact, two of the deaths occurred within a day or so of each other. Today, that jail is used to house the sheriff's department and I can't help wondering whether or not it could be haunted as well....or perhaps, even cursed by the gentleman who hanged himself at the "old" jail. Theresa's Note: As of January 2019, the original link to this story on the WVGhosts website isn't active; it appears as if the story has been taken down completely. However, there is ANOTHER story listed on the website from the Kingwood area---the Craig Civic Center! I'll be posting more about that story later on, but I've included the link if you wanna get a head start on reading about another of Preston County's haunted buildings! Is the shariffs department haunted and is their still today activity in both buildings libaray and sahriffs department? To answer my question email me at emaleetitchenell@yahoo.com thank you. I'll email you, but just in case: I'm not from the Kingwood area and have no idea whether or not people are still experiencing activity at the library, and to my knowledge, the sheriff's department has never publicly reported any type of activity. Sorry I couldn't be more help; perhaps you can contact these institutions directly for more information! Cool thanks for replying I try to talk to taps but they ignore me. I have other questions do you know if their are any teams in preston county or close to preston county that I could contact to go on an investigation with? Thank you so vary much.